The Old Walpole Meetinghouse is proud to present the first in its series of August Lectures. 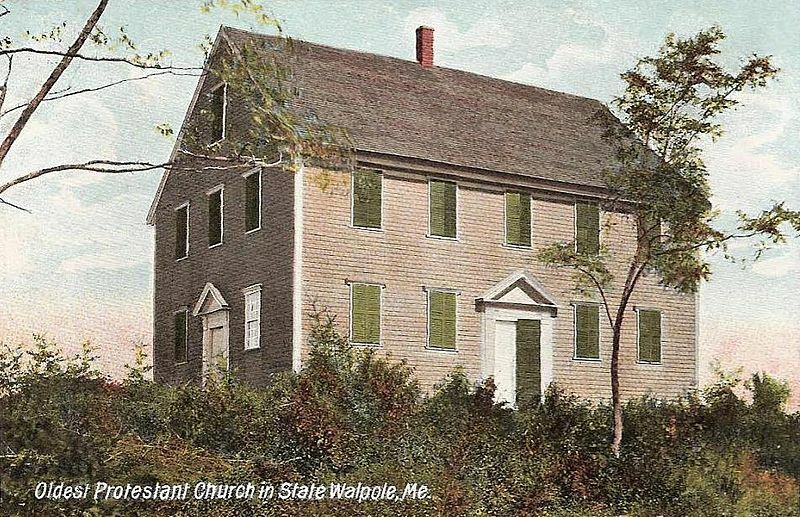 On Sunday, August 17th and Sunday, August 24th at 3:00pm the public is invited to the Meetinghouse to explore this historic building and hear lectures from two local experts on social issues of 1772, the year the Meetinghouse was built. The first lecture, “Religion in the Eighteenth Century on the Pemaquid Peninsula,” will be given by Dr. Byron Stuhlman. A retired Episcopalian minister, Dr. Stuhlman had parishes in New York and Connecticut and is a former faculty member at Hamilton College. He is now on the faculty of Coastal Senior College. The first Europeans to live in the Pemaquid were, as Dr. Stuhlman says, “more interested in Cod than God,” however the permanent settlers were more religious. Unlike the Puritans of Massachusetts these newcomers were largely Scots-Irish and Presbyterian. Although there was little separation between church and state in the early days and meetinghouses were used for both church services and community political meetings, issues began to develop as Baptist and Methodist preachers began to move in and demand equal pay from the towns. Along with the violence over competing land claims and the great social conflict that led up to the Revolution, this was a turbulent time. Phillis Wheatley, the first African-American poet to be published, is the topic of the second lecture to be delivered by Dr. Harold Schramm. With graduate degrees in both English and Law, Dr. Schramm taught for many years at Western Connecticut State University. Wheatley, born in Africa in 1753, came to Boston as a slave when she was seven. Her owners, the Wheatleys, taught her to read and write and encouraged her to write poetry. She was very well educated for a woman of her tine, knew both Latin and Greek, and was praised for her poetry by George Washington with whom she corresponded. Even though she was eventually freed by her owners, illness and poverty took a toll on her life. This is a fascinating true story for those of us in New England who are fond of the tales of Harriet Beecher Stowe and Elijah Parish Lovejoy. It is worthwhile remembering that slavery still existed in Maine at the time the Meetinghouse was built in 1772. It was not abolished until nine years later. If you go up into the balcony of the Meetinghouse you can see the seats set aside for the slaves and indentured servants to use. Please join us on August 17th and 24th at 3:00pm. There is no charge. The Meetinghouse is on Old Walpole Meetinghouse Road just off Route 129 in Walpole.